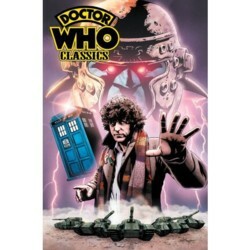 Collects Doctor Who Classics (2007- IDW) #1-5. Written by Pat Mills and John Wagner. Art by Dave Gibbons. Cover by Joe Corroney. IDW Publishing is proud to add to its Doctor Who line with this collection of classic Doctor Who comics, featuring some of the best talents in the business! Up first, adventures featuring the Fourth Doctor courtesy of Pat Mills, John Wagner, and Dave Gibbons (Watchmen). Originally published in black and white, each page features all-new, state-of-the-art coloring by Charlie Kirchoff and an art gallery by cover artist Joe Corroney, too.